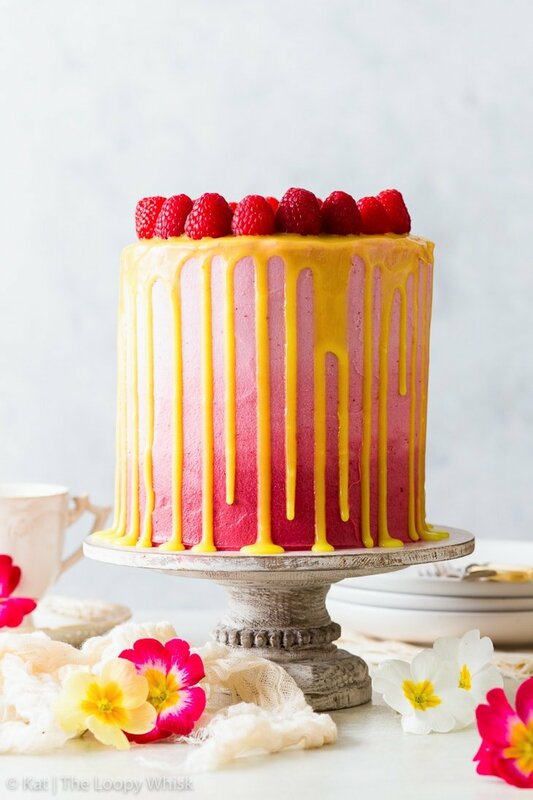 This vegan raspberry & lemon cake is as pretty as it is delicious. 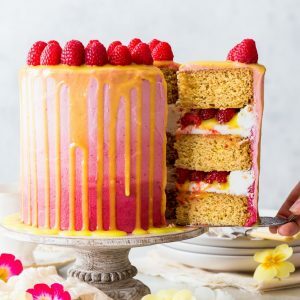 With fluffy, moist vegan sponges generously scented with lemon zest, a luscious vegan frosting, a refreshing vegan lemon curd and an abundance of fresh raspberries, it’s everything you might want a cake to be – and more. 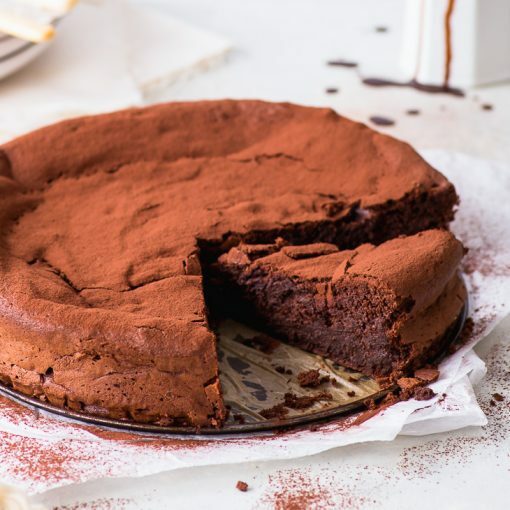 The perfect dessert to make this Easter! How do you celebrate spring? The blossoming and the colours and the warm sunshine that makes you want to bask in it like a lazy cat for hours on end. 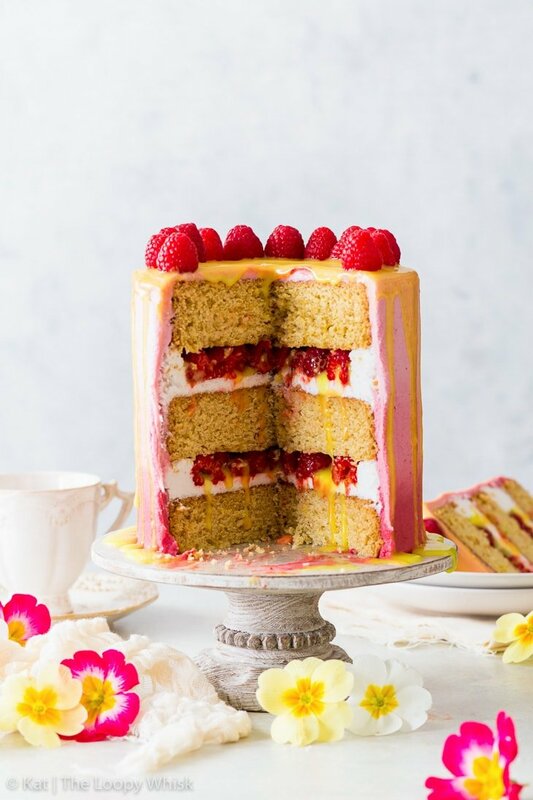 So here’s today’s spring-inspired offering: a vegan raspberry and lemon cake, which tastes just as marvellous as it looks. And, if I do say so myself, it looks absolutely stunning. The sponges are vegan lemon cake sponges, scented with a whole lot of lemon zest. They’re moist, soft, and infused with the most wonderful lemon flavour – and without any “egg replacements”! 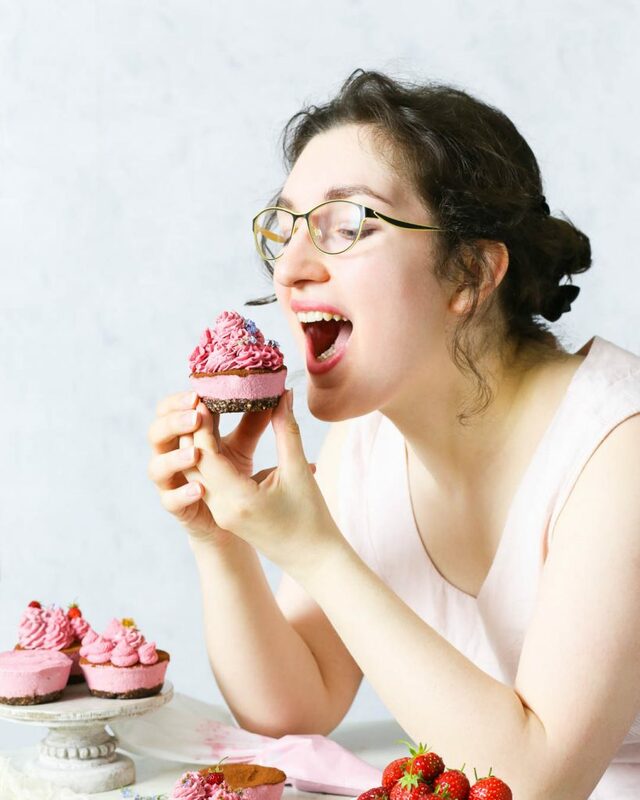 … on the outside, the frosting has a beautiful pink ombre effect achieved by flavouring the vegan frosting with a raspberry reduction. Aside from giving it the most stunning colour, this also gives the frosting a wonderfully refreshing raspberry flavour. 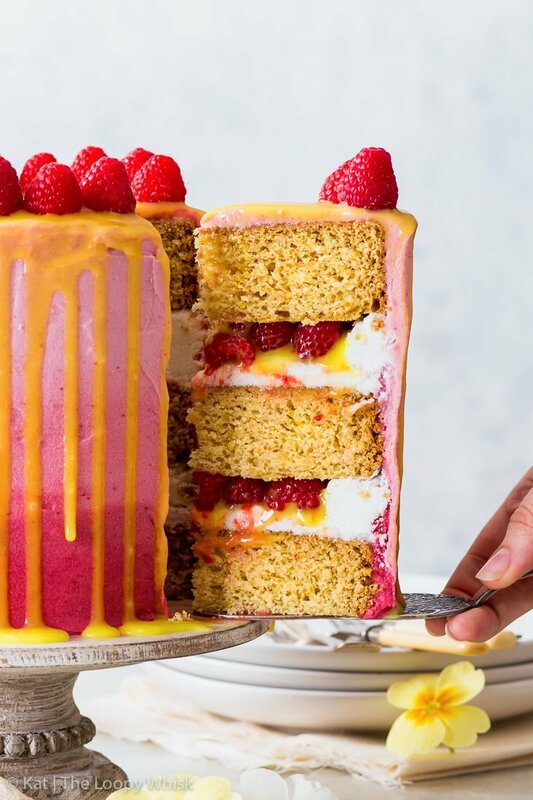 The lemon sponges and frosting are layered together with vegan lemon curd (perfectly balanced between acidic sharpness and sugary sweetness – it elevates the whole cake to a whole new level) and fresh raspberries. 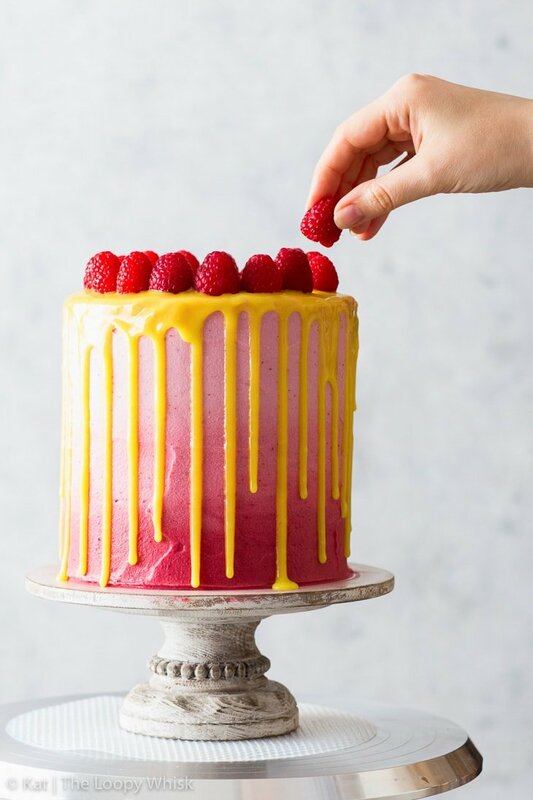 The whole cake is finished off with an eye-catching bright yellow lemon curd drip and a crown of fresh raspberries, as is fit for cake royalty. I’m sure we can all agree that the end effect is simply… WOW. 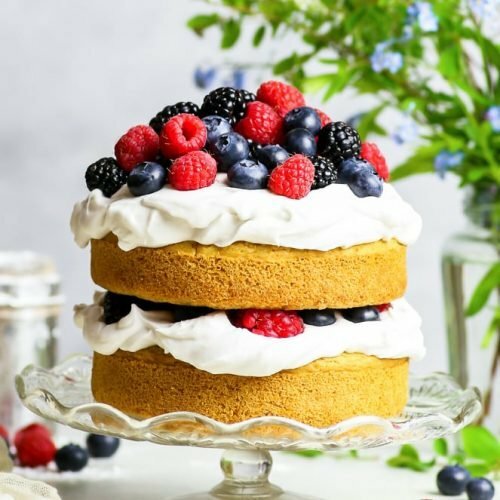 Even better, the whole cake – from the sponges to the frosting and lemon curd – is made exclusively with ingredients from Aldi UK. I love shopping at Aldi, especially when it comes to ingredients for vegan baking. Their coconut milk makes the most perfect vegan frosting, and I absolutely swear by it! 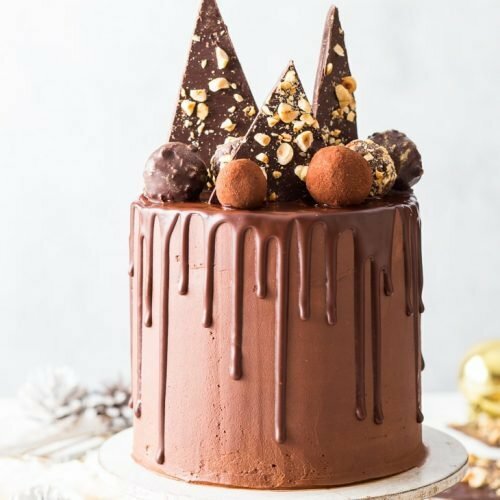 Now, this gorgeous vegan cake has many components. Inevitably, that will mean it takes slightly more time and effort to prepare… but trust me, it’s worth every single second. I mean, the results pretty much speak for themselves, don’t they? 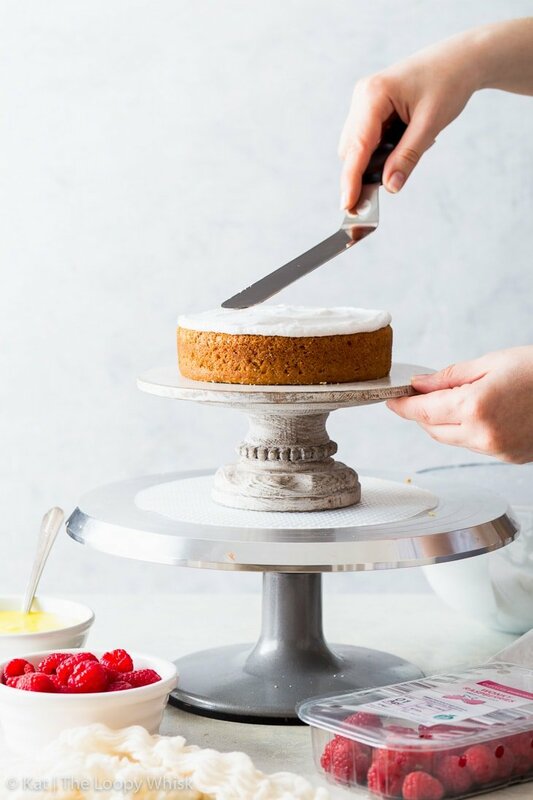 How do you make vegan lemon cake sponges? Sift together plain flour, baking powder and baking soda. Add a small mountain of lemon zest. and distribute the batter evenly between lined cake tins. Finally: bake – until the sponges are nicely risen, golden brown and an inserted toothpick comes out clean. I love that this recipe gives perfectly level sponges every single time – no need to cut off any doming! How do you make vegan lemon curd? Just as with the vegan cake sponges, making vegan lemon curd is really easy! and a pinch of turmeric (for the colour). 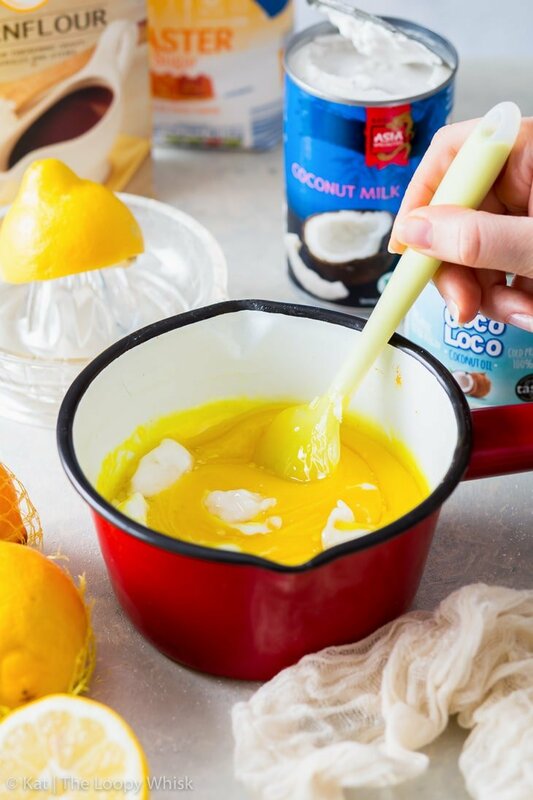 Once thickened, stir in some coconut cream and coconut oil – and then, behold the wonderful lemony result! 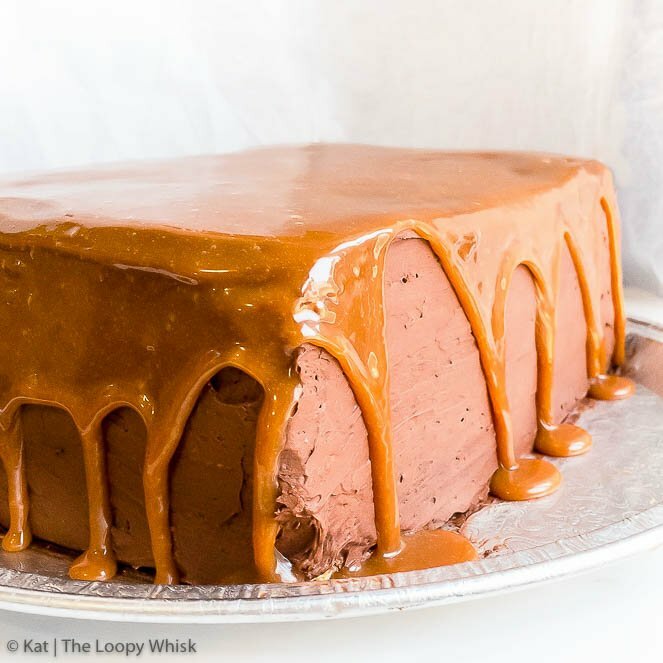 How do you make vegan frosting? Okay, bear with me on this one. 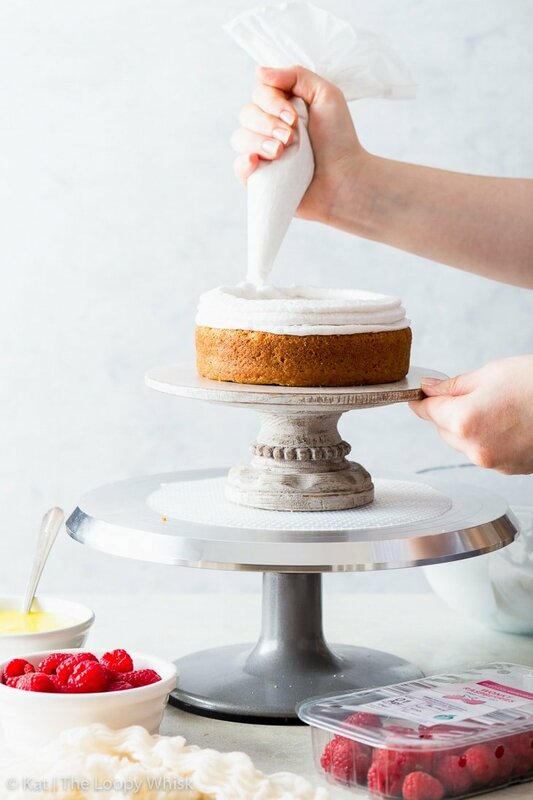 The procedure is a bit unconventional, but I promise you it works every single time and will give you the most wonderful fluffy, delicious vegan frosting that pipes and holds its shape wonderfully. We’ll use, of course, Aldi’s coconut milk and coconut oil. 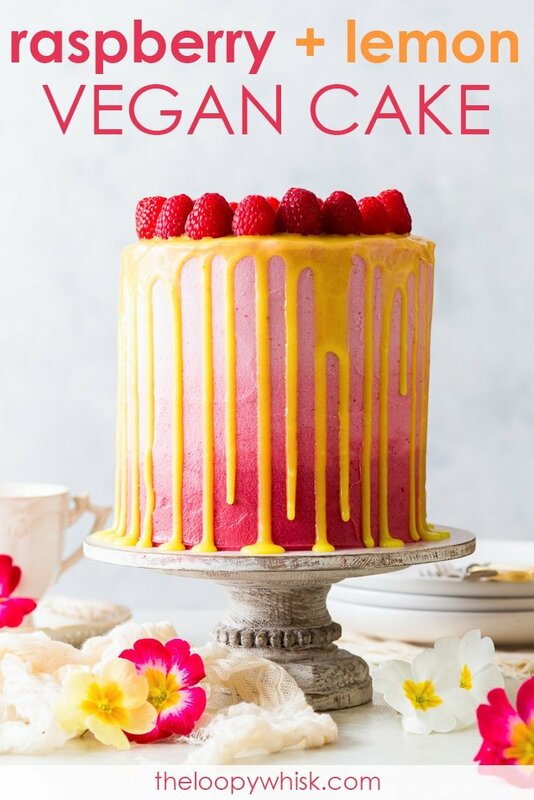 They give the frosting a wonderful texture without an overwhelming coconut flavour, which is perfect for this gorgeous raspberry & lemon cake. Before starting, it’s important you only use the coconut cream part of the coconut milk. To do this, just place the coconut milk in the fridge for a few hours (or preferably overnight) – this will cause the milk to separate into gorgeous, thick coconut cream and coconut water. You’ll only need the coconut cream part, but coconut water is brilliant in smoothies! but will eventually transform into this delicious white fluffiness – as if by magic. You can definitely speed up the cooling of the mixture by placing the bowl into some cold water – just make sure to whisk it frequently. And here’s the end result: VEGAN FROSTING PERFECTION! Now, we come to the fun part: assembling all the individual components into the prettiest cake (ever). First up, spread some of the plain vegan frosting onto the bottom sponge. Then, pipe an additional ring of frosting on top of the layer of frosting. This will essentially act as a dam to hold in the vegan lemon curd. 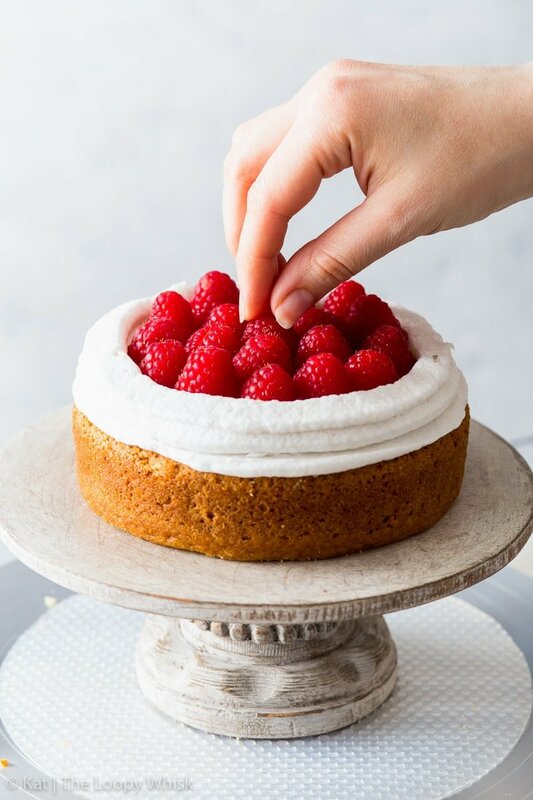 The ring of frosting should be about as high as the fresh raspberries (you’ll see why in a second). Spoon some of the lemon curd into the middle and spread it around so it forms and even layer. 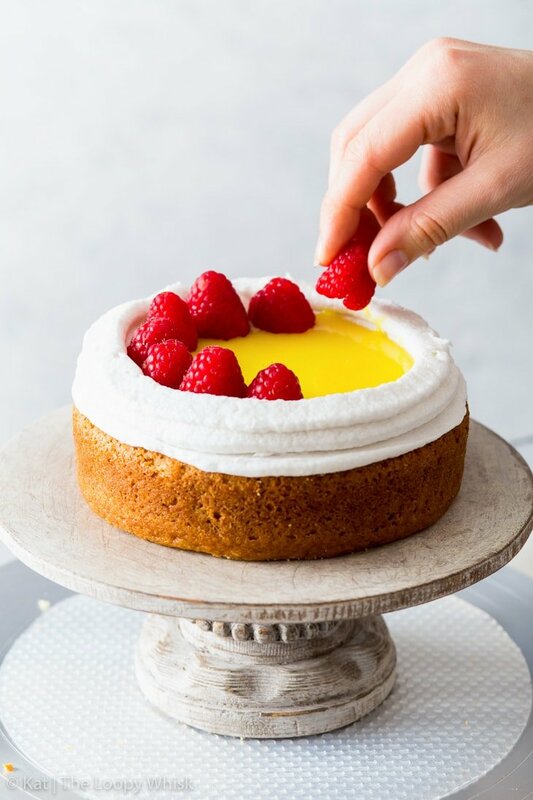 Then, repeat the same process with another layer of sponge, frosting, lemon curd and raspberries, and top with the third sponge cake. Smooth out the sides of the frosting, and refrigerate for at least 15 minutes. 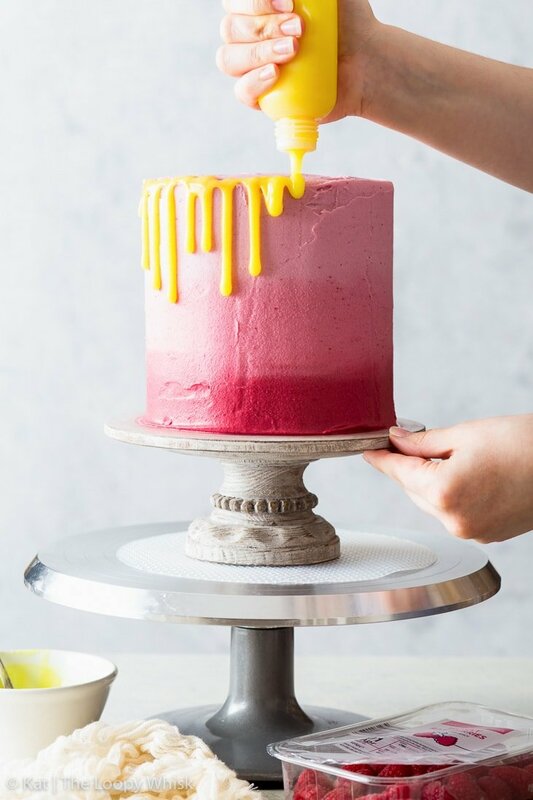 This is the perfect time to prepare the three shades of raspberry frosting, which we’ll use for the pretty ombre effect! And once the outside of the cake has been frosted and prettified: the lemon curd drip! For best results and a controlled drip, I like to use a small squeeze bottle, but you could just as easily use a spoon. Just get creative and have fun! To finish everything off, the crowning glory: the crown of fresh raspberries on top of the cake. Because the cake is stunning and colourful and jaw-droppingly gorgeous as is, I kept the decorations simple. That, however, doesn’t mean that you have to do the same! You could decorate this vegan cake with edible flowers, pretty swirls of piped frosting, or even fancy vegan macarons. 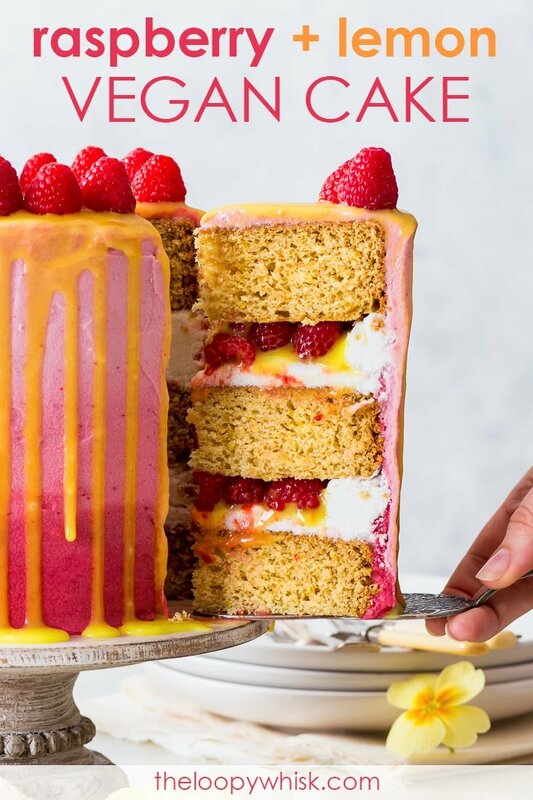 But don’t let it fool you: this vegan raspberry & lemon cake is so much more than just a pretty exterior. Much more importantly, it’s delicious, with a wonderful balance of textures and flavours that complement and raise each other up to new heights. It’s a refreshing kind of cake, where the sweetness of the frosting is tempered by the gentle acidity of fresh raspberries and lemon curd. It lifts you up, makes your tastebuds tingle and dance – and puts a smile on your face. As far as celebrations of spring (and beautiful Easter desserts) go… this is by far my favourite one. I hope you’ll love it just as much as I do. 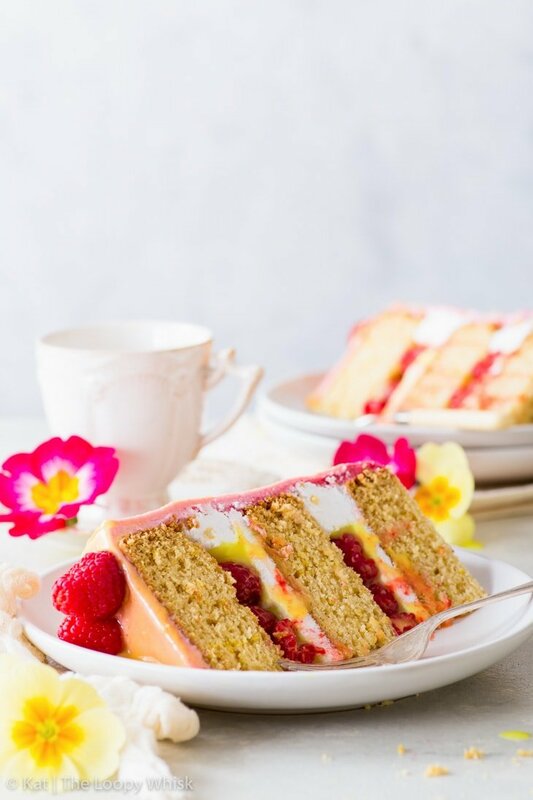 This vegan raspberry & lemon cake is as pretty as it is delicious. 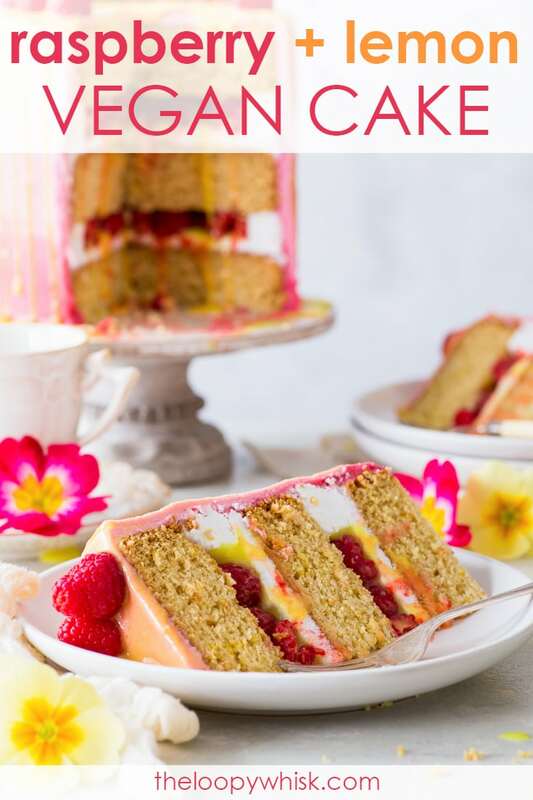 With fluffy, moist vegan sponges generously scented with lemon zest, a luscious vegan frosting, a refreshing vegan lemon curd and an abundance of fresh raspberries, it’s everything you might want a cake to be – and more. Pre-heat the oven to 355 ºF (180 ºC) and line three 6 inch (15 cm) round cake tins with baking/greaseproof paper. Into a large bowl, sift together plain flour, baking powder and baking soda. Add the sugar, salt and lemon zest, and mix well. 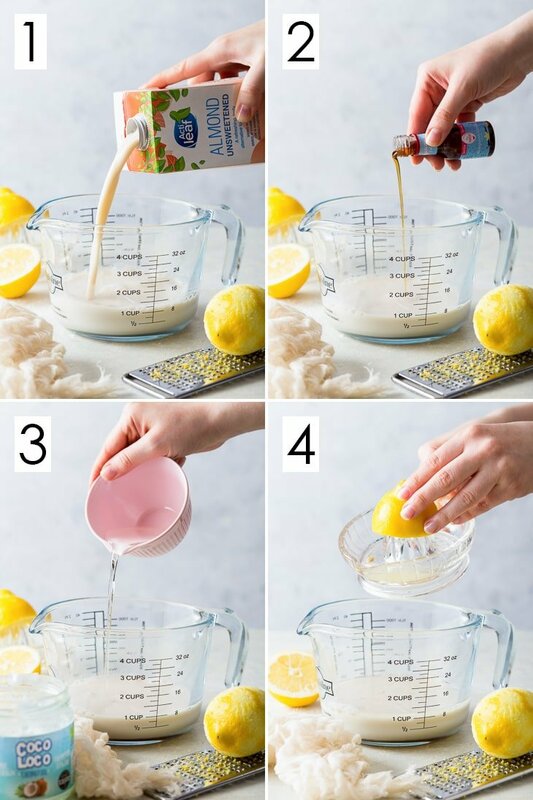 In a separate bowl, mix together the almond milk, melted coconut oil, lemon juice and vanilla extract. Add the wet ingredients to the dry, and whisk well until you get a smooth cake batter. 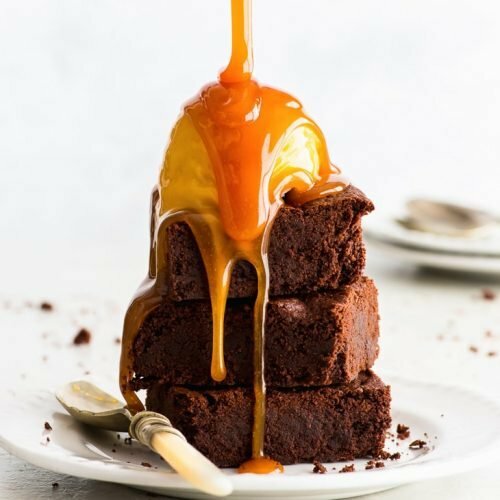 Distribute the cake batter evenly between the three lined cake tins, and bake at 355 ºF (180 ºC) for about 30 minutes, or until risen, golden brown on top and an inserted toothpick comes out clean. Allow to cool in the cake tins for 5 - 10 minutes, then transfer the sponges to a wire cooling rack and let to cool completely. Into a small saucepan, add the lemon juice, sugar, cornstarch, salt and turmeric. Cook on medium heat for about 10 minutes with constant stirring, or until thickened (it should cover the back of a spoon). Add the coconut cream and coconut oil, and stir until both are fully dissolved and incorporated. Allow to cool completely, then place into the fridge until needed. In a saucepan, combine the coconut cream, coconut oil and icing/powdered sugar. Cook on medium-low heat until fully dissolved, then remove from the heat and transfer to a bowl. Using a stand mixer with the whisk attachment or a hand mixer with the double beater attachment, whisk the melted mixture on high speed. As is cools down, it will thicken and become white and fluffy. You can speed up the cooling process by placing the bowl into come cold water (if using a hand mixer) or surrounding the bowl with something like bags of frozen peas (if using a stand mixer). NOTE: Don't over-whisk the frosting – stop at the soft peak stage (it should look like whipped cream). If you over-whisk it, it can become grainy or split. Also note: make the frosting maximum 5 to 10 minutes before you intend to use it. It sets quite quickly – and once it does, it becomes difficult to pipe or spread. - Distribute the melted mixture of coconut cream, coconut oil and icing/powdered sugar evenly between three bowls. - Add a bit of the raspberry reduction to each bowl, in different amounts, so as to achieve the different shades of pink (I've used ~1/2 tsp for the lightest shade, ~1 1/2 tsp for the middle shade and ~1 tbsp for the darkest shade of pink). Then, follow the same procedure as for the white frosting. NOTE: Make the pink frosting maximum 5 to 10 minutes in advance. 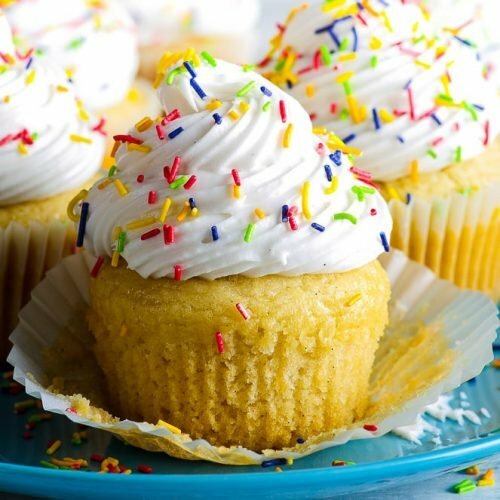 Spread some of the plain frosting onto the bottom sponge, making an even layer. Pipe an additional ring of the plain frosting on top of the layer of frosting. This will essentially act as a dam to hold in the vegan lemon curd. The ring of frosting should be about as high as the fresh raspberries. Spoon about 3 tbsp of the lemon curd into the middle and spread it around so it forms and even layer. 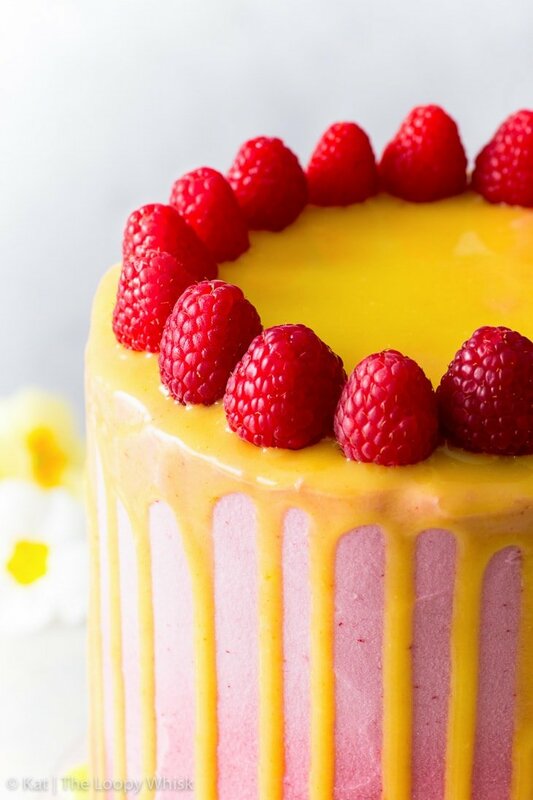 Arrange fresh raspberries onto the lemon curd. 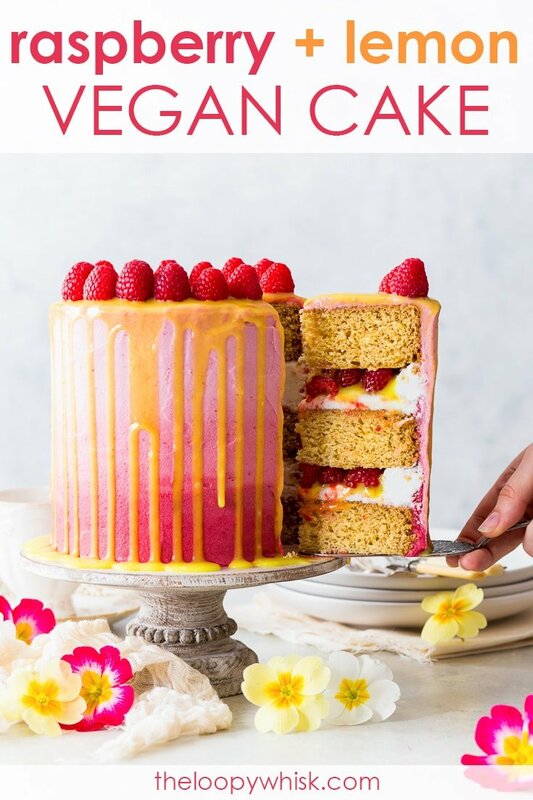 Repeat the same process with another layer of sponge, frosting, lemon curd and raspberries, and top with the third sponge cake (see photos in post). Smooth out the sides of the frosting, and refrigerate for at least 15 minutes. Pipe rings of pink frosting around the cake, piping the darkest shade of pink on the bottom and the lightest shade at the top. Smooth out the frosting, creating the ombre effect. Chill the cake for at least 30 minutes in the fridge, or until the frosting has firmed up. 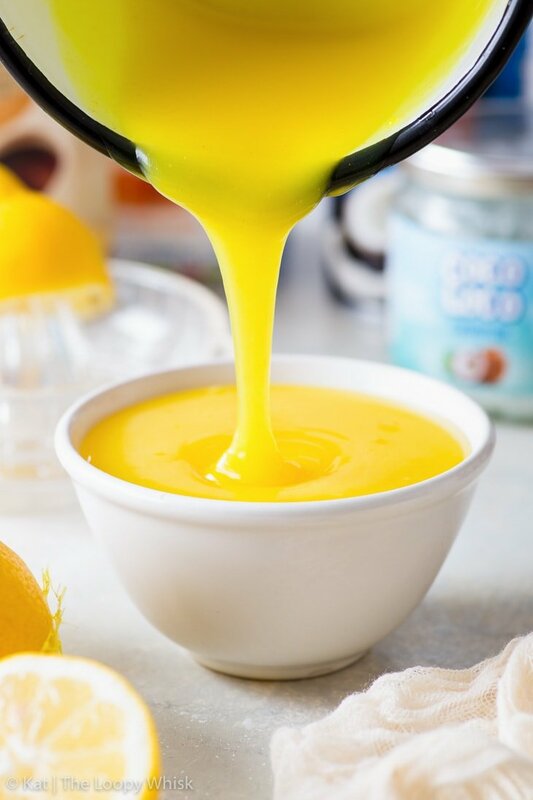 Using either a squeeze bottle or a spoon, create the lemon curd drip down the sides (make sure the lemon curd is properly cool, best straight out of the fridge). 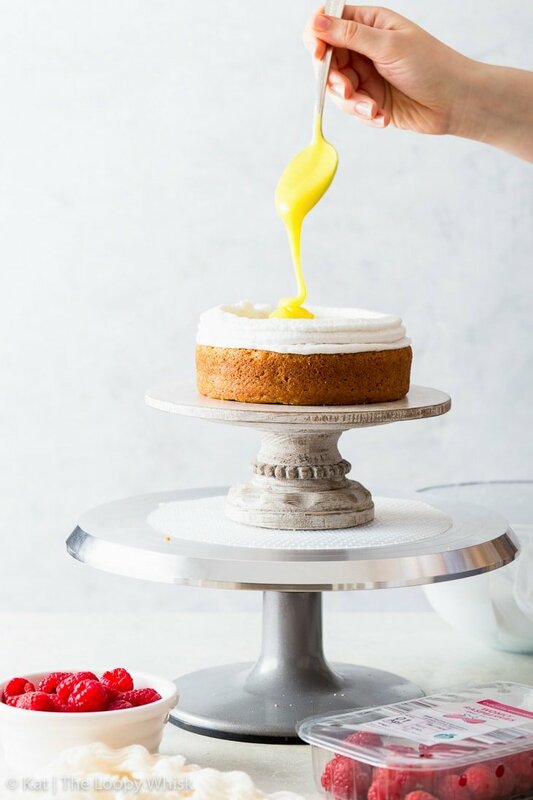 Cover the top of the cake with an even layer of lemon curd. Decorate the top of the cake with fresh raspberries (or other decorations of choice). The vegan raspberry & lemon cake keeps well in a closed container or covered in cling film in the fridge for 3 - 4 days. Note 1: You can get coconut cream by putting the coconut milk into the fridge for a few hours (or preferably overnight) – without shaking! The coconut milk will separate into coconut cream (that you'll need in this recipe) and coconut water (which is great in smoothies).